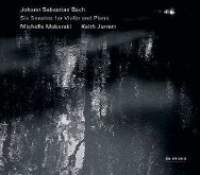 The musical range of pianist Keith Jarrett span universes; violinist Michele Makarski has also explored beyond her immediate neighborhood. Here they’ve joined together to play Johann Sebastian Bach’s Six Sonatas for violin and keyboard, the keyboard in this case being piano. If some will contend that Bach himself would have preferred the piano had one been available, and therefore that’s the way to play his works now, others will insist that everybody should be constrained by the choices actually available to the composer, making some sort of plucked string instrument the only historically correct (or even “acceptable”) choice. But Keith Jarrett being Keith Jarrett, and Michele Makarski being Michele Makarski, they focus on the message rather than on the medium. And if Makarski doesn’t produce a opulent modern sound on her instrument, she hasn’t gone over to the (light? dark?) side either. The sonority she produces combines the power of the modern violin with an open quality that suggests but doesn’t quite recreate an older ideal. Both musicians may be skilled improvisers, but they largely refrain from indulging in such creative fantasies here. So while the first and third movements of Bach’s Sonata No. 1 in B Minor remain just a bit on the staid side of center in their reading, there’s ample nuance, which goes a long way toward compensating for any lack of improvisatory fancy. The two fast movements seem even more straightforward, though heady in their forward motion, with the quickly moving counterpoint in the piano part dazzling in its brilliance at their chosen tempos. In the Sonata No. 2 in A Major, the voices also remain preternaturally clear in the first movement, with trills adding crackling embellishment; in the third, the piano part bubbles cheerfully beneath the violin’s longer lines. Makarski sounds almost throaty in the Finale’s opening; and as the music progresses, the duo’s exuberance enhances rather than obscures the lines’ complexity. The first Adagio of the Sonata No. 3 in E Major, more homophonic, makes a stately impression, and the unique quality of Makarski’s tone blossoms freely perhaps for the first time in the program. But however reserved the reading might become, it never sounds inflexible; it’s graced by especially sensitive rhythmic give and take at the movement’s end. The second movement again combines a strong forward impetus with complex voice-leading. Makarski’s period-like sound dominates the Adagio, even if it occasionally recedes to allow Jarrett’s interjections to capture the listener’s attention. In the Finale, Makarski the virtuoso remains keenly aware of the intricacy of the brilliant part she realizes. The second disc comprises the second three sonatas. The first of these, No. 4 in C Minor, opens with the movement that mirrors some of the grander features (though not the details) of the aria “Erbarme dich” from Bach’s St. Matthew Passion; Makarski and Jarrett give a performance so transparent that it hardly resembles what musicians hewing close to the romantic approach have made of it, a statement redolent of intellectual if not sensuous musical suggestiveness. Makarski and Jarrett make the most the interweaving of lines, rapid-fire, in the second movement. Makarski’s preternaturally clear, viola-like tone emerges once again in the second Adagio and remains, though grittier, in the Finale, which maintains at the outset a low tessitura. That pure alto tonal quality also characterizes the opening movement of the Sonata No. 5 in F Minor and, magnificent though it may be in itself, becomes an almost distracting presence by virtue of its expressive power. However busy the chords may become in the second movement, Jarrett seems to keep track of them horizontally as well as vertically. Although in the third movement, Makarski’s repeated double stops sound somewhat abrasive as they ride (rather than float) over Jarrett’s figuration, the duo’s high seriousness makes their vision rise above the tonal materials from which they’ve constructed it; Makarski makes the chromatic subject of the final movement sound intriguing indeed. Together, they reveal the rigorous contrapuntal working out in the first movement of the brighter five-movement Sonata No. 6 in G Major (with a “cembalo” solo at its center). But they don’t require complications to stimulate their imaginations: they probe just as deeply in movements like the brief, slow second movement. Jarrett rollicks in the solo movement, weighting the voices carefully and producing, as he does throughout the set, a clear, rock-solid bass line. The engineers have captured the duo up very close, revealing some breathing, which, in this case, seems more an artifact than a mannerism. The performers’ exuberance makes the Finale a satisfying conclusion not only to the Sonata but to the entire set. The set invites comparison with another, recorded by violinist Jaime Laredo and pianist Glenn Gould (released on CD in 2012 in Volume 7 of Sony’s Glenn Gould Collection, Sony 88725412822): Laredo plays in a lavish style very dissimilar to that of Makarski, while Gould achieves almost preternatural clarity in the keyboard part—but together, they’re mesmerizing. The sets by Arthur Grumiaux (Philips 4264522) on a modern violin but with full continuo support (but with harpsichord) and the astringently energetic set by Monica Huggett and Ton Koopman (Philips 4104012) on a period violin also provide alternatives to this one, which may strike some listeners as at times excessively severe or intensely geometric. But however these impressions linger, they do so in conjunction with an overwhelming sense that the performers open a door onto almost limitless worlds that large numbers of repeated listenings will hardly begin to exhaust. Strongly recommended, therefore, to all listeners, however strong their preferences for various approaches to the instruments, to Bach’s music, or to music in general.